One of Hungary’s most successful businessmen, banker Gábor Kovács began a career at the Hungarian National Bank that would peak in the position of vice president at Citibank London in the second half of the 1980s. Upon returning home, he decided to indulge his desire for new challenges, and in 1991 founded his own company, which is now called Bankár Holding Plc. The same disposition led him to the world of visual art, the passion of collection, which was to become an essential and decisive experience, something that also opened new vistas for his ideas and activities. “It was a tapestry, Zsuzsa Péreli’s Aequilibrium, that made me realize in 2002 that I had been looking for equilibrium in my life in the wrong dimension. As a banker, I mainly strove for liquidity, or horizontal, balance, when real balance can in fact be found vertically, between good and bad. Spiritual balance is far more important. A new world opened before me. What matters most is not the goal, but the way there, the gaining of the experience. Fate will set your direction; determining your own direction will lead to an arduous struggle—you have to fulfil the inevitable, your own fate. In 2004 Gábor Kovács set three goals for the newly established KOGART: to popularize Hungarian art, in particular contemporary art, both in Hungary and abroad; to support the youngest generation of artists with exhibitions, scholarships and purchases; and to create a collection for the Foundation that would offer a historically valid overview of Hungarian art in the past 50 years. Much of the programme has become a reality. With the FRESH exhibits and the KOGART Prize, we were the first to offer the youngest generation of artists an opportunity to meet a wide audience. We presented more than fifty exhibitions in Hungary and half a dozen abroad, making an important contribution to the vibrancy of the cultural scene. Since 2006, we have dedicated one or two exhibitions annually to the great masters and periods of classic art, creating very successful shows. We have cooperated with the most important Hungarian public collections and prestigious foreign museums, and in recent years we invested significant energies in international relations. 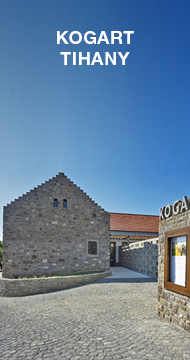 In 2013 we opened KOGART House in Tihany, our first branch in the country. The development of the collection has also been successful: the Foundation now owns about 2500 works by more than 350 artists. While many of them are priceless, there are also pieces we sorely miss. In the years to come, we want to concentrate on quality. By 2020 we would like to turn the collection into a corpus that meets scholarly standards in its representation of Hungarian visual art between 1950 and 2020. For the same reason, over the past few years we have published innumerable books, DVDs and other specialist literature about our exhibitions and works of art in our holding. Education has also become part and parcel of our activity: our painting appraiser training programme is very successful, and we plan to launch further programmes. The world has changed considerably over the past decade, and the Foundation must keep abreast of these changes. Young artists now have more benefactors to turn to, so the Foundation has chosen to provide much needed support for the middle generation. The number of exhibition-goers is on the decline, and their expectations have changed; together with a new economic climate, this compels us to change our strategy. Currently we are seeking new fields of activity, start new enterprises, and try to locate new financial resource, so as to start our next decade at new locations, with a new approach, and a secure background.